Holsteins are large cattle easily recognised by their distinctive markings which are typically black and white but also red and white. They are renowned for their outstanding milk production. Their gestation is around nine months and it is optimum for cows to calve for the first time at around 24 – 27 months old. 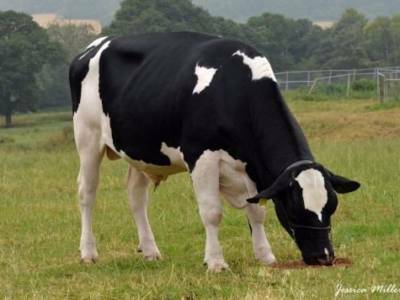 They are one of the most popular breeds in the world due to their outstanding milk production, will to milk, health trait improvements such as cell count, fertility, lifespan and calving ease. They are the highest milk producers and have the highest genetic achievement ability, capable of a 1 to 2% genetic improvement per year. They are a highly adaptable breed suitable for all management systems, equally suited to grazing as housed or mixed farming systems and low-cost farming systems. Holsteins produce vigorous calves that are easy care, demonstrate rapid growth and early maturity.